Glacier Discovery train passengers are met at 9:30 am by Conductor Steve Culver who starts out his announcements by saying "goooooood morning" while increasing his voice intensity. He has everyone's attention instantly and for the rest of the day's journey. Mr. Culver gives commentary throughout the day on a PA system in the coach car. 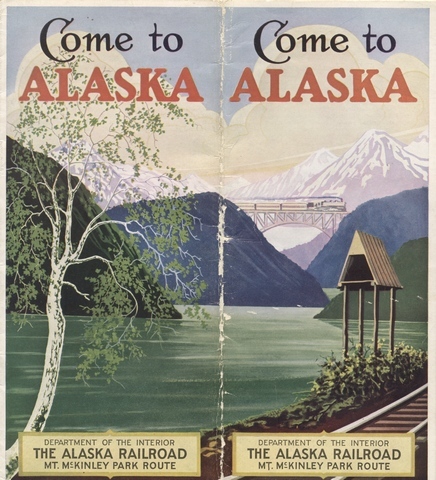 In over 30 years on the Alaska Railroad, Steve has learned every inch of this route and much its history. Five times a week during the daily passenger season riders find out why this conductor is the best ambassador a railroad could have! Riding on the Glacier Discovery with Steve is like hitting a Grand Slam. 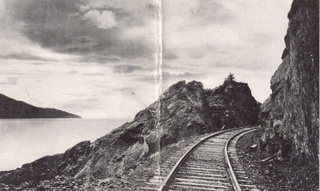 You will hear history of the railroad and see wildlife, possibly a bore tide, the ocean, rivers, waterfalls and glaciers. In 2002 and 2003 I have seen bear, moose, eagles, swans, salmon and sheep from the Glacier Discovery train. You will face the facts of Alaska's world class scenery in the 160 miles over 12 hours you invest here. This train is only three cars and one locomotive and leaves the Anchorage Depot, milepost 124, at 10 am sharp. 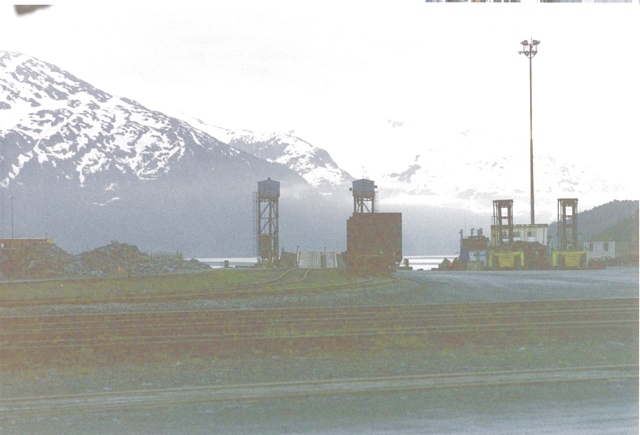 Alaska Railroad mileposts (south to north) are numbered from 2 at Seward to 356 at Faifbanks. MP 0 to 2 are in Resurrection Bay at Seward, claimed by the 1964 Good Friday earthquake. In 2003, the train consists of a GP-38, a baggage car, a coach with extra large windows and a stainless steel sided RDC which allows for travel in both directions. In 2004, the railroad may substitute a cab car made from an ex-Amtrak F-40 locomotive in place of the RDC. The Glacier Discovery is an excellent introduction to the Kenai Peninsula area of southcentral Alaska. The train proceeds southbound from Anchorage to Whittier via Portage. 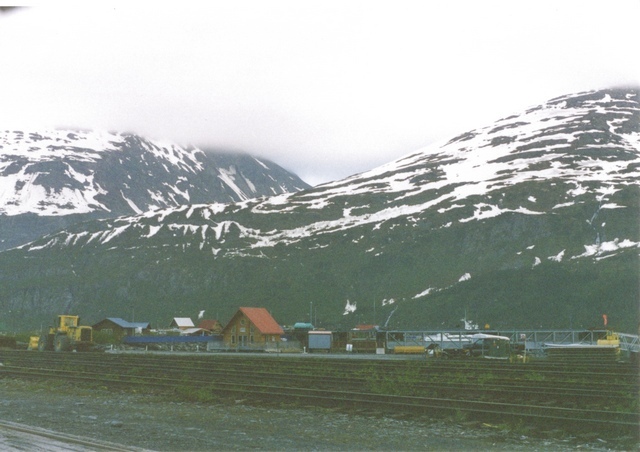 It lingers in the area 60 miles south of Anchorage to visit Alaskan territory inaccessable by car before returning to Anchorage The first order of business south of Anchorage was a "meet" at Potter Marsh with the northbound cruise train from Seward. The Glacier Discovery train pulled into a siding for the other train to get to Anchorage. After that, our train backed out onto the mainline and we headed south towards Portage. Southbound views on the right side of the train are dominated by the Turnagain Arm of the Cook Inlet of the Pacific Ocean. Across the water is the Kenai Peninsula mountains with snow and glaciers. The left hand side view is the Chugach Mountains which rise behind Anchorage. One particular spot on the land side has cliffs rising upon which Dall sheep inhabit. Most times I have been by here the sheep are too and this day we saw them both directions. It is very common aboard Alasaka Railroad to hear people relay throughout the car "moose, or bear, right side!" During the beautiful journey southbound, Conductor Steve had a few minutes to visit with the children aboard the train. We had nice weather at departure but ran into rain north of Portage. The Glacier Discovery reached Portage around noon and switched onto the Whittier Branch line for a 12 mile run from the mainline to Whittier. The Whittier Branch was built in the early 1940's by the Federal government during World War II. as an ice free deepwater alternative to Seward on the coast. The port and town of Whittier lie on the Prince William Sound. It is the barge rail head of the Alaska Railroad to connect with the lower 48 states via Seattle since there is no continental rail connection to the rest of north America...yet. The railroad employs a modern fleet of 3 large barges that transport rail cars and containers on top. There is a huge barge slip to replace the one destroyed in the 1964 Good Friday earthquake. Whittier was hit hard by the quake caused tsunami and the petroleum tank farm at the head of Passage Canal was destroyed. Whittier was used as a military base until the early 1960's and about 300 people presently live there. 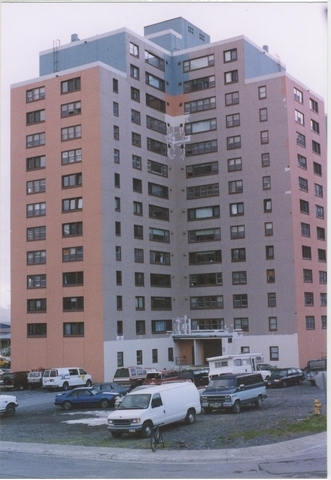 A few remnant buildings remain, most notably the 14 story tall Begich Towers. Most residents live there and visitors can stay there too in June's Bed and Breakfast. Until 2000 Whittier was accessible only by boat, rail or float plane-not via road. Prior to the rebuild of the second tunnel now renamed Anton Anderson Memorial Tunnel, the ARR ran a service called the Whittier Shuttle in which one could ride from Portage to Whittier as a passenger in an ex SP gallery car or actually drive your automobile or RV onto a railroad flat car and be transported to the other end of the branch. Some people who drive to Whittier take the Alaska Marine Highway System ferry boat to points such as Valdez, Kodiak Island, or points south like Juneau, Skagway and other inland passage locations. Sunset on the AMHS during the summer solstice voyage from Kodiak to Seward lasts for about 4 hours! The town has a very nice small boat harbor with many charter fishing boats for halibut or salmon. In the past I have stayed in Whittier, gone fishing and brought home some tasty halbut. Before we arrived in Whittier, conductor Steve announced that the stop would be no longer than 15 minutes and that if you wanted food from any restaurant, you had to order "to go." Your choice was either clam chowder from Varly's Swiftwater Seafood Cafe or a quick run though the Korean buffet, if it was happening. Passage Canal is a long fjord on the western end of Prince William Sound. Some train passengers were departing to take a 6 hour cruise of Passage Canal glaciers on either Major Marine Tours craft or Phillip's Cruises and Tours boat. One tour company has a hot food buffet while the other offers their guests meals portioned and both serve drinks and sodas at their respective bars. These tours can be booked through the Alaska Railroad website as package GD-2 or GD-3. The Coast Guard Auxilary District 17 is present in the caboose parked next to the harbormaster's office. The train engineer and fireman changed from the locomotive end to the RDC and after an air test, we left town destined for Spencer Glacier. One board the train, Conductor Culver has a bookrack set on a coach seat in which to display literature from local Whittier businesses. When he works the wintertime passenger train (Anchorage to Fairbanks) books from Shannon Cartwright, the well known Alaskan children's author, are available. The above two photographs show the Whittier portal of the Anton Anderson Tunnel which is 2.5 miles in length. The right picture shows the railroad signal set to allow train movement and automobile gates and changeable message sign.